Today is the World Day of the Sick, a good day to talk about some things that have been on my mind for a while. Let me start with a true story from a hospital in Colorado. A chaplain was visiting an elderly African-American woman, her face worn by age and illness. They talked about coping with suffering. The chaplain was young and didn’t have much to say to the old woman. He had studied theology, so he knew that only good things come from God, but he couldn’t explain that in a helpful way. But the patient had something to say to him. And there’s the first point I’d like to make today. Suffering does not come to us from God. 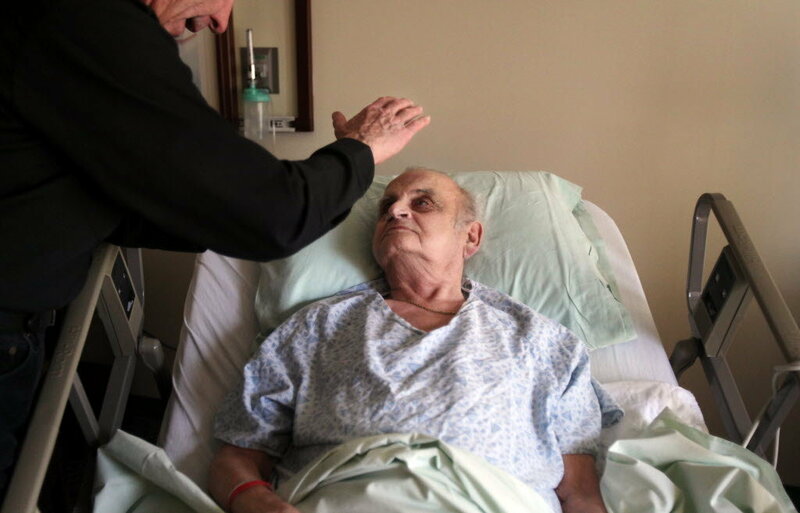 Even if the chaplain wasn’t as brilliant as his patient, the story also makes my second point: the pastoral care of the sick is important, and an important part of the Church’s mission. Suffering can lead some people to turn away from God, but they can grow closer to God if they are helped to meet Jesus in their suffering. It also changes us for the better. If we believe the media, suffering is an absolute evil. And yet suffering is part and parcel of following Christ, who, St. Peter says, suffered for us so that we would follow in His steps. Christians should not seek suffering, but when it can’t be avoided, it can become beautiful; it can teach us many lessons; it can unite us with Christ. But we often need help to turn to God in times of illness. Embracing our suffering in union with Jesus is not exactly the first thing we think about when we’re in pain. We need spiritual support to make use of what we already know, or need to know, about how God works to bring good out of evil. Pope Francis speaks of the art of accompaniment. Who needs spiritual accompaniment more than those who are gravely ill, and those who are worried for them? We need help in thinking clearly about our situation, so that we can pray properly. The whole front page of the bulletin this week talks about what parishioners should do to ensure they have spiritual guidance and the blessing of the sacraments in times of serious illness. 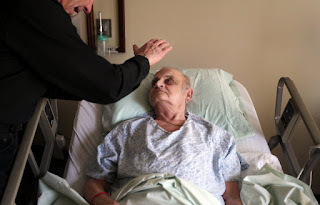 The practical side of it is nothing new to anyone of my generation, but perhaps younger Catholics have not been taught what to do when they or a loved one face illness; and maybe some of the older Catholics are forgetting what they’ve learned or just afraid to bother the priests for the sacraments when in hospital. I’m not going to repeat what’s in the bulletin. But I will tell you that not letting us know you’re having surgery, not calling when a loved one has been rushed to hospital, is not only the wrong thing to do, it’s also no favour to the priests! I can’t tell you how many times I’ve gotten back from Lions Gate Hospital only to bump into someone in the parking lot who asked me if I knew that Joe Blow had a heart attack last week – which, of course, means turning around and heading straight back to the hospital. Not to mention some unkind thoughts about Joe Blow! And there’s my third point: the Church can’t help you to face illness if you don’t ask. We are not automatically informed when a Catholic is admitted to hospital like we were in the good old days. Mary Kim, a lovely parishioner whose funeral I celebrated on Wednesday, got things right. She gives us an example of how Catholics should prepare for serious surgery and of the blessings that come to the sick from the sacraments of the Church. Some weeks ago, Mary Kim learned that an illness she had dealt with for some time would require surgery. Well before her admission, I was called to her home, where she and I celebrated the sacrament of Penance. When we were finished, other family members joined us as she received the sacrament of the sick and Holy Communion. We prayed for her and with her using the lovely words provided by the ritual. Sadly, the surgery did not go well, and her condition became grave. Immediately, the family called us and Fr. Giovanni went to the hospital to celebrate Last Rites with her. Please notice that the sacrament of the sick is not identical with the Last Rites as once it was. A few days later, as death approached, I went to the hospital and said the powerful Prayers of the Dying by her bedside, joined by her husband and children. When it came time to celebrate her funeral, it came as the natural conclusion to a time of preparation and prayer. Who in the Church today would want to miss these blessings because we prefer to remain in denial about the seriousness of our condition, because we don’t want to suggest the sacraments to a loved one, or even because we don’t want to bother the priests? Nothing like pastoral care was offered to the lepers we meet in the Gospel this morning. The First Reading gives us a pretty ugly picture of the misery of leprosy and of the community’s fear of the disease. Isolation can be the worst part of illness or a hospital stay. We need the support of our communities—our families, our friends, and our church. And Jesus gives the simplest possible response: “I do. Be clean.” On the one hand, we could read this passage and fall right into a trap. We might pray, “Jesus, if you want to, you can heal my cancer” and then become deeply unhappy that we’re not healed. Doesn’t he want to heal me, or my loved one? I have spent years thinking about this. If God is all-powerful, why doesn’t he continue the healing miracles that Jesus performed on earth? The answer to the question would take much longer than a Sunday sermon allows. But to put it simply, the guarantee of miracles on demand would mean the end of faith on earth. People everywhere would figure out that freedom from illness was the jackpot offered to every Christian. I don’t want to be flippant, but the world would be stacked ten feet deep with people, because we’d all be praying our aged loved ones back from the brink of death every time they came close. Jesus is still a healer. But in the first place He’s a healer of souls. His meeting with the leper is presented in the very first chapter of St. Mark’s Gospel, at the very beginning of his ministry. Jesus uses healing as a way of proclaiming the Kingdom of God; they were not ends in themselves. The Dictionary of Christian Spirituality points out that Jesus sets the pattern for Christian healing. There’s always two expectations: first, healing from the immediate illness or problem, and second, healing to bring about closer union with God in the circumstances of one’s life. “The priority is always the health of [our] relationship with God, no matter what other kind of healing may be needed.” (pg. 467). About ten days ago my niece, Ali, fell off a small cliff while hiking in Vietnam. Between the distance and the problems of communication, her parents spent a night of sheer terror unsure whether she would live or die. As things turned out, her injuries were not life-threatening, and she was able to have surgery even in the provincial city near where the accident occurred. She’s now recovering in a very nice hospital in the capital, attended by a very, very, relieved father. Needless to say, the Smith family did a lot of praying and it’s hard not say those prayers weren’t answered. But what would I be saying today if things had not gone well? Would I tell you that our prayers were not answered? Or would I just keep silent? I’d like to think I would tell you my prayers had been answered whatever the outcome. I’d like to think I would tell you that God works for good in all things for those who love Him. And I’d like to think I would give priority to the health of my family’s relationship with God, no matter what other healing happened or didn’t happen. Even now, I hope that I and my family will thank God more for the spiritual blessings emerging from those dark days than we do for the wonderful way things have turned out. I almost never speak more than 10 minutes, so I don’t feel too bad that today’s homily is so long. It’s been a long time coming, because I’ve been getting more and more concerned about whether we are forgetting the help the Church can offer the sick. Please read the bulletin carefully this week. Tell your family you want them to call a priest if you’re suddenly taken ill or have a serious accident. Don’t hesitate to ask for the sacraments before major surgery or if your health starts to fail. That may be the CtR way, but it’s not the Catholic way. We don’t deal with illness alone, but with the help of Christ and his Church. *Nicholas Senz, “God Can't Give You What He Doesn't Have,” Catholic Digest, January/February 2018.